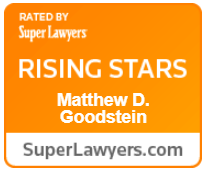 Home / About Us / Matthew Goodstein, Esq. MATTHEW GOODSTEIN is a personal injury attorney at Pollack, Pollack, Isaac & DeCicco, LLP. Mr. Goodstein regularly collaborates with partner and personal injury attorney, Adam Handler, to develop a personalized strategy for each case that will help our injured clients obtain the best results possible. Mr. Goodstein is a 2005 graduate of the Indiana University – Kelley School of Business, Bloomington, Indiana and a 2008 graduate of the John Marshall Law School, Chicago, Illinois. After graduating law school, Mr. Goodstein served as an Assistant State’s Attorney (ASA), representing the State of Illinois in criminal prosecutions. During his time as an ASA, Mr. Goodstein successfully tried countless jury trials, bench trials, hearings and motions. After leaving the State’s Attorney’s office, Mr. Goodstein practiced civil litigation and workers’ compensation in a boutique law firm, representing accident victims and injured workers. Mr. Goodstein lives in New Jersey with his wife and kids.